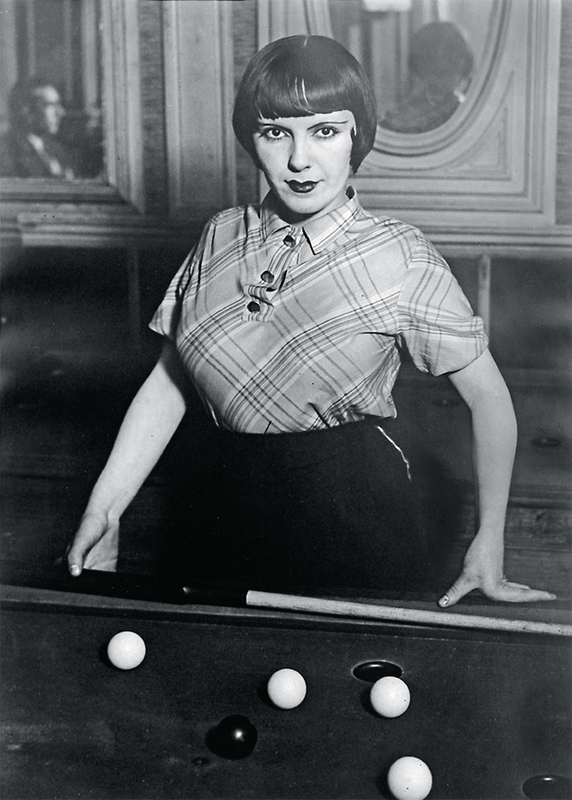 Brassaï, A prostitute playing Russian billiards, Boulevard Rochechouart, Montmartre, ca. 1932, gelatin silver print, 15 3/8 × 11 1/4". © Estate Brassaï/RMN, Grand Palais. “I photographed whatever happened to catch my attention . . . any one of the thousands of chance events of everyday life,” wrote Brassaï in The Artists in My Life in 1982, at about the same time that Nan Goldin was prototyping the diaristic slide show that later became The Ballad of Sexual Dependency. A decade earlier, the posthumous monograph Diane Arbus had revealed the seldom-seen denizens of a world that moved in the same orbit as the secret Paris traversed by Brassaï in the 1930s and the louche haunts frequented by Goldin and her cohort in the late ’70s and ’80s. Curator Lanka Tattersall, with her finger on the pulse of today’s image-saturated media culture, brings these “Real Worlds” together with some one hundred photographs drawn from the three photographers’ seminal publications, as well as a digital presentation of Ballad. The catalogue places Tattersall in conversation with some of today’s most original voices in the realm of identity politics: Hilton Als, Maggie Nelson, and A. L. Steiner. Thanks to Gotthold Ephraim Lessing and Clement Greenberg, the Greek statue of Laocoön is indelibly associated with modernism’s strict separation of narrative and plastic arts. Now that medium-specific studio artists have ceded ground to project-based multitaskers experimenting with documentary, ethnographic, and archival research, however, perhaps we need to revisit the story behind the statue. After all, who is Laocoön if not the first critic to caution against accepting an artwork at face value? This survey of art from the past twenty years, featuring more than thirty international artists, will foreground how objects are tasked with relating (and, more problematically, verifying) historical narratives. One notable inclusion is Jill Magid’s The Proposal, 2016, a diamond ring made from the ashes of the preeminent Mexican architect Luis Barragán. A catalogue with contributions from Lynne Tillman, Julie Ault, Chris Kraus, and others should offer crucial insights into whether contemporary art has become a vessel for ecstatic truths or simply a Trojan horse.